NamUs provides technology, forensic services, and investigative support to resolve missing persons cases. Medicolegal death investigators are connected with people and resources to resolve unidentified decedent cases. Family members of missing persons are empowered with tools to search and enter their missing loved one into NamUs. The sheer volume of missing and unidentified person cases poses one of the greatest challenges to agencies tasked with resolving these important cases. NamUs is a national information clearinghouse and resource center for missing, unidentified, and unclaimed person cases across the United States. Funded and administered by the National Institute of Justice and managed through a cooperative agreement with the UNT Health Science Center in Fort Worth, Texas, all NamUs resources are provided at no cost to law enforcement, medical examiners, coroners, allied forensic professionals, and family members of missing persons. The NamUs database application fills the nation’s need for a unified, online, free, secure database for unidentified remains and missing persons records. NamUs provides free forensic services, to include forensic odontology, fingerprint examination, forensic anthropology, and DNA analyses through the UNT Center for Human Identification. Family DNA collection kits are also provided at no cost. NamUs’ seasoned staff consult on cases and support criminal justice efforts to drive resolution – all free of charge. NamUs subject matter experts provide free training and perform direct outreach to families of the missing by coordinating Missing Person Day events with agencies across the country. The NamUs database fills an overwhelming need for a central repository of information related to missing, unidentified, and unclaimed person cases. The database is searchable by all, with biometric and other secure case information accessible only to appropriate, vetted criminal justice users. Missing person records can be entered into NamUs by anyone, including the general public; however, all cases are verified with the appropriate law enforcement agency prior to publication in NamUs. Unidentified and unclaimed person records are entered into the NamUs database by medical examiners, coroners, and other criminal justice designees. 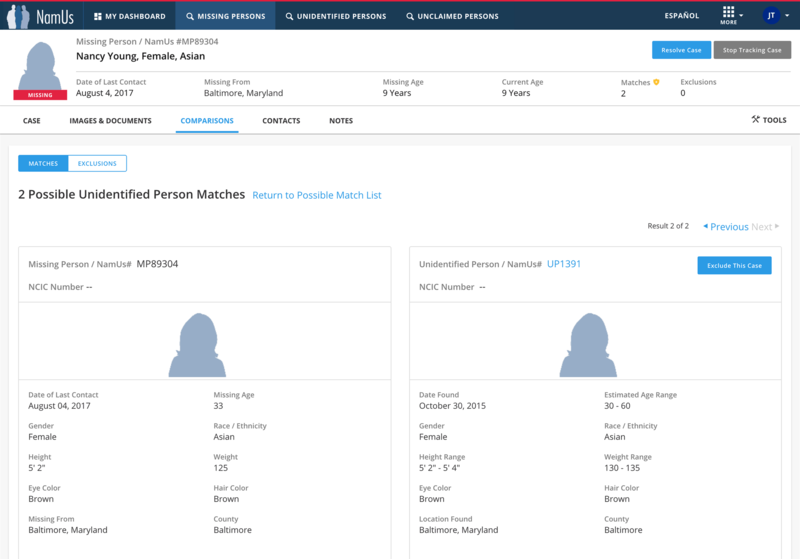 Missing and unidentified person cases in NamUs are automatically compared to locate potential matches based on dates, geography, and core demographic information. Advanced searches can be performed to locate matches based on additional unique descriptors such as scars, marks, tattoos, clothing, jewelry, etc. 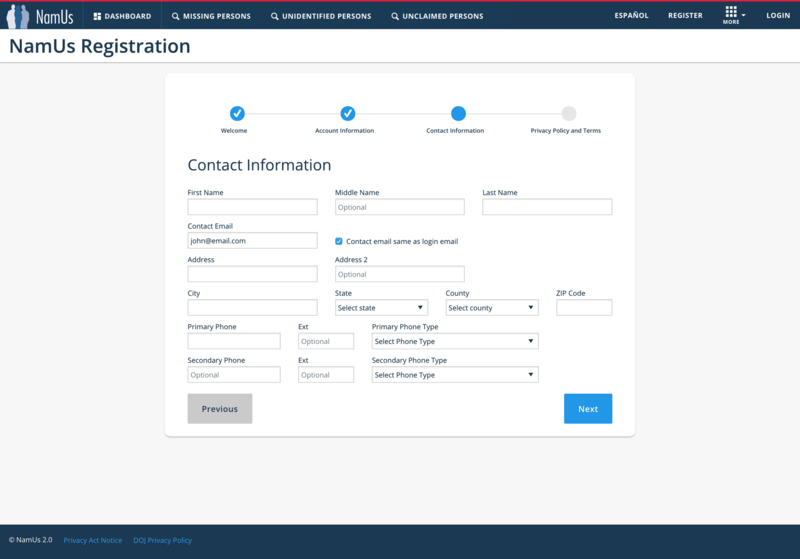 Streamlined system registration and case entry improves overall user experience with wizards, dashboards, modern web tools, and a single login for all case types. 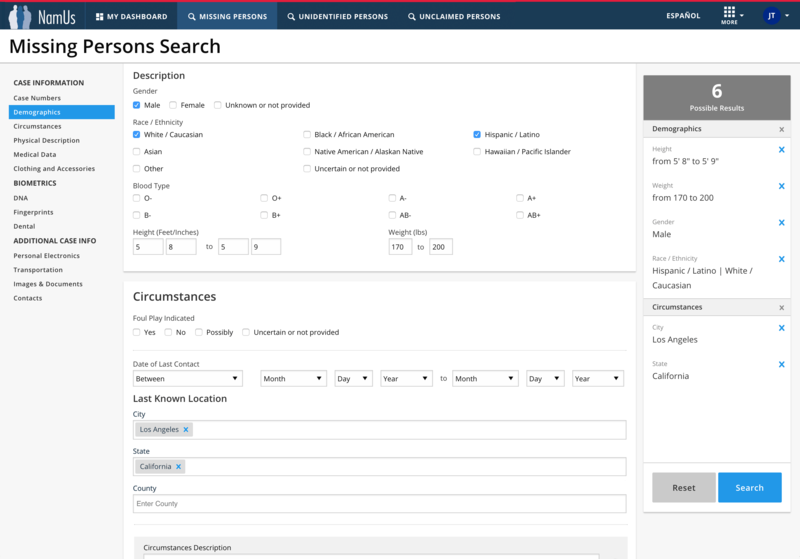 Upgraded “advance search” tools enable faster and more complex searching of the system to increase case resolutions. Manage both Missing and Unidentified cases from one central location. Moved the NamUs system to the OJP SecureCloud to enhance system performance while maintaining the highest level of security of sensitive case data and personally identifiable information. Individually map cases directly from the NamUs record, or display advanced search results on maps that pinpoint specific address locations for vetted professional users. Updated case matching algorithms increases resolutions by enhancing demographic and geographic searching. NamUs Regional Program Specialist (RPS) hold Department of Justice security clearances and are experienced professionals from the criminal justice and/or forensic science communities. RPSs provide investigative support to missing, unidentified, and unclaimed persons by providing case consultations, assisting with the collection of biometric information, facilitating NamUs forensic services, and providing training and guidance on the effective use of the NamUs 2.0 database application. The UNT Center for Human Identification’s Missing Person’s Unit performs nuclear and mitochondrial DNA analyses to assist with the identification of missing and unidentified person cases. In addition to nuclear DNA, UNTCHI is one of a small number of laboratories capable of developing and uploading mitochondrial DNA profiles to CODIS. Fingerprints are a widely recognized and cost-effective biometric marker. They are a reliable means of personal identification that enable rapid comparisons – when submitted to NamUs, fingerprints are immediately available for comparisons that can result in positive identifications or exclusions. The NamUs Fingerprint/AFIS Unit assists with scanning, classifying, uploading, analyzing, and comparing fingerprint information submitted to NamUs. All fingerprint images provided to NamUs are also digitized and uploaded to an internal AFIS database for searching and comparison, and all unidentified decedent prints are also submitted to the FBI’s Latent Print Unit for searching in the national Next Generation Identification (NGI) database. Law enforcement, medical examiners, and coroners rely on dental records to establish legal and verifiable identifications of missing and unidentified persons. Dental records provide an opportunity to make rapid, cost-effective, detailed comparison between individuals for inclusions or exclusions of potential matches. Agencies can directly upload dental information for missing and unidentified person cases to NamUs, which is a secure, central repository. NamUs forensic odontologists can also be contacted to digitally scan, code, and upload information to NamUs cases on behalf of investigating agencies. All dental information uploaded to NamUs is available for 24/7 professional comparisons. NamUs odontologists also complete NCIC dental worksheets that allow agencies to upload accurate and complete dental information to NCIC. The NamUs Communications Division responds to media inquiries, performs outreach to media, coordinates social networking efforts, and collaborates with victim advocate groups across the country to increase awareness and use of the NamUs program to resolve cases. 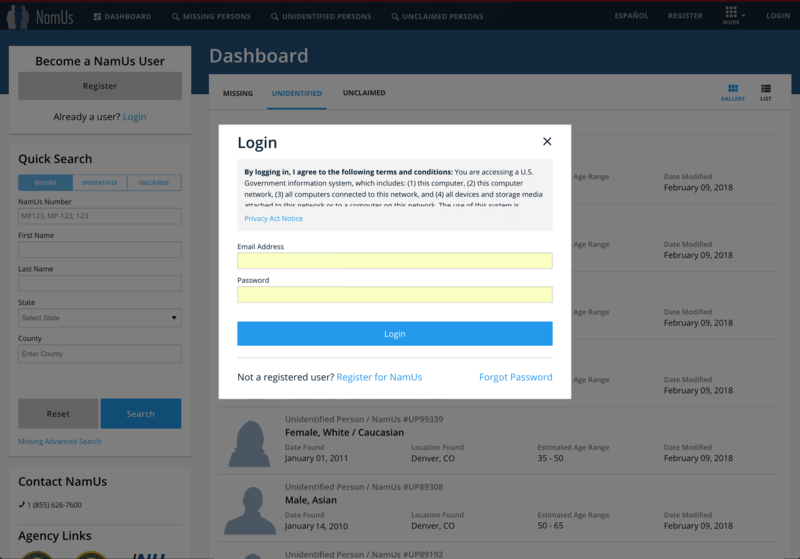 Individualized assistance learning the NamUs 2.0 database application. 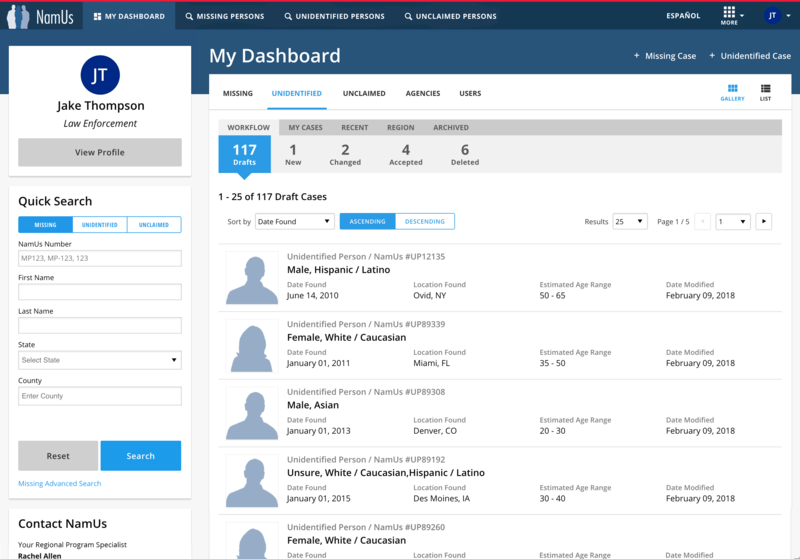 Customized, online or classroom training for agencies on the NamUs 2.0 database application, forensic services, and the effective use of NamUs tools to resolve missing and unidentified person cases. Presentations at local, state, and national training conferences (see www.untfsu.com/events for upcoming opportunities in your area). Assistance with the coordination and implementation of local and statewide “Missing Person Day” events to enter cases into NamUs and facilitate the collection of family reference DNA samples. NamUs provides technology and resources to resolve unidentified decedent cases across the country. The NamUs Analytical Division also assists with the location of family members for next of kin death notifications and DNA sample collections for comparison. 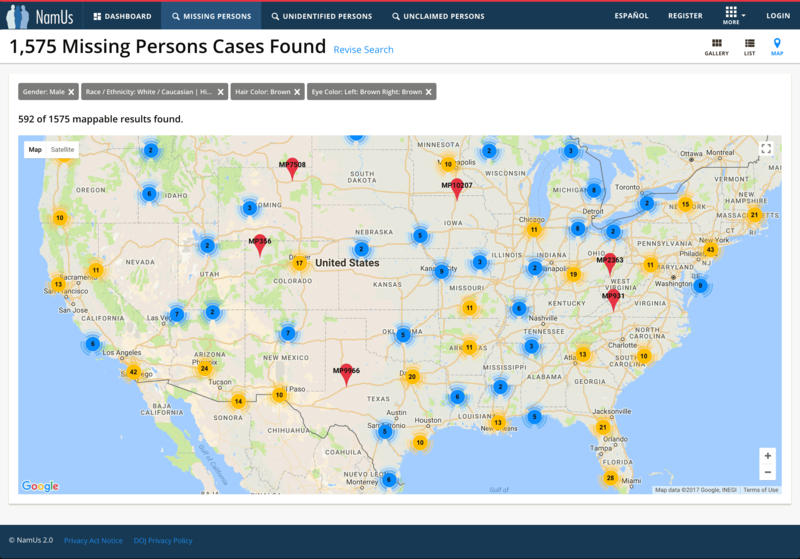 NamUs connects law enforcement with tools and resources to resolve missing person cases, including state-of-the-art technology to securely store, share, and compare case information with other criminal justice professionals. NamUs provides tools that empower family members of missing persons to enter and search case information, and connects families with criminal justice professionals to assist in the search for their missing loved ones.